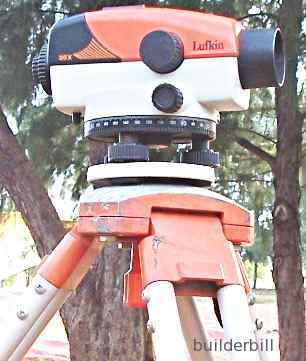 A tripod mounted optical instrument that is used for obtaining levels in construction work. It's use require one person to read the instrument and on person to hold a staff that readings are taken from. An early form of optical levelling instrument. It is a commonly misused term when referring to a Builder's Automatic Level. The dumpy has a levelling tube that has to be set at each swing of the instrument. Further it gives an upside down reading in the view finder. It has no auto features. A surveyors and builders aid in levelling. Most commonly an extendible aluminium rod with chequered painted graduations on the face. In close work it could just as easily be a simple board with pencil marking on it. The Builder's Automatic Level as it is correctly called is an instrument that is easy to set up as it only has a simple circular levelling bubble glass. As long as the level is set with the bubble centred in the glass, then the inner hanging prism will automatically compensate for further differences and give a true horizontal reading through a telescope device. 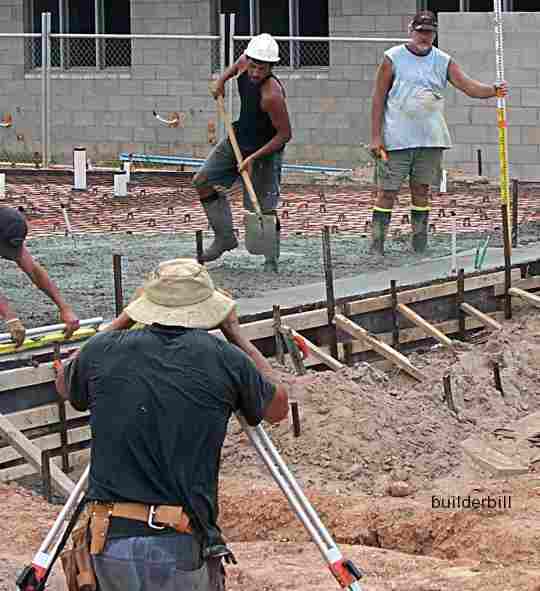 In the photo here two men are using an auto level while laying a concrete slab. The guy on the staff will receive hand signals form the foreman telling him to raise or lower the particular patch of concrete. The concreter will then screed between the patches to create a level slab. Go to this page to learn how to check a level for true and to set it. 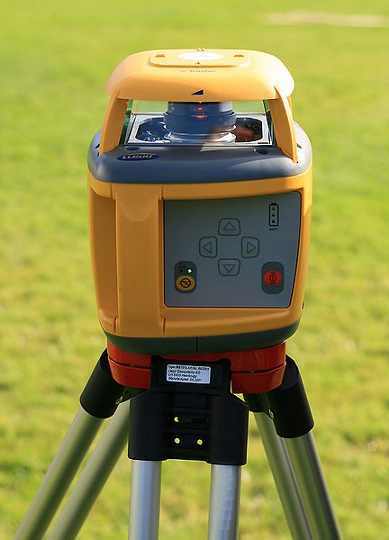 A construction laser level can be set up on a tripod at a convenient place on a work site and switched on. At the core of the instrument is a spinning disk that emits a series of pulses of light on a level place 360 degrees around the instrument. A single person can set up a special receiver staff on a datum point. The staff and or the laser instrument makes a specific sound when the staff is then held at the level of the datum. By raising or lowering the staff one person, unaided can mark or check levels around a work site. 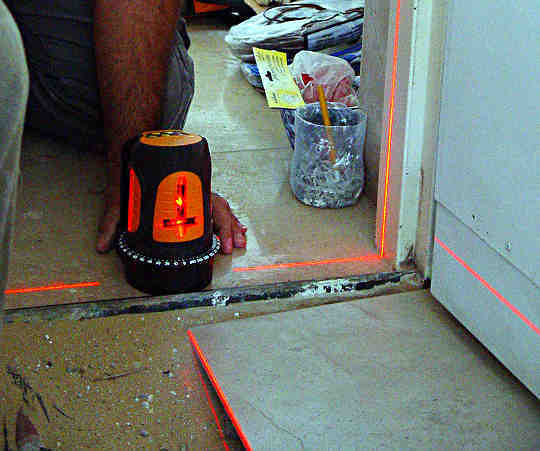 Above is a laser that emits pulses of light that show as vertical or horizontal lines on adjacent walls and floors. One of the first trades to embrace the use of this type of laser technology were the guys that fix suspended ceiling inside large large building areas.